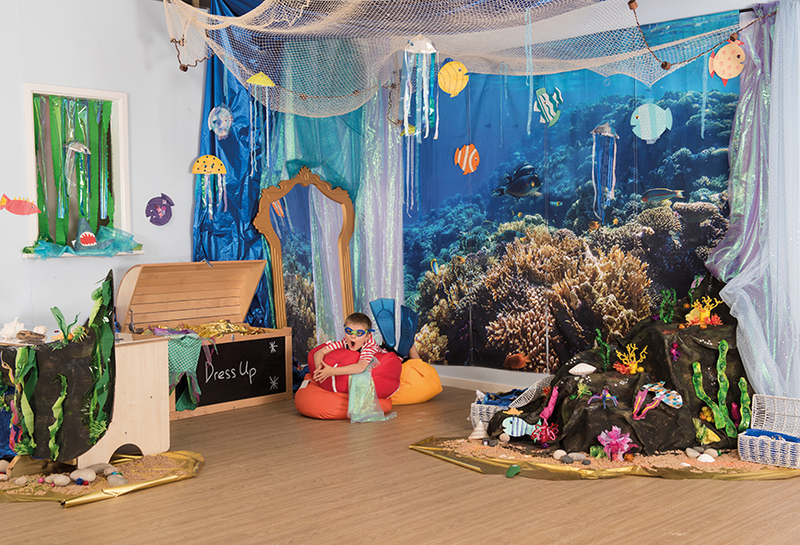 A range of immersive classroom display ideas to inspire. 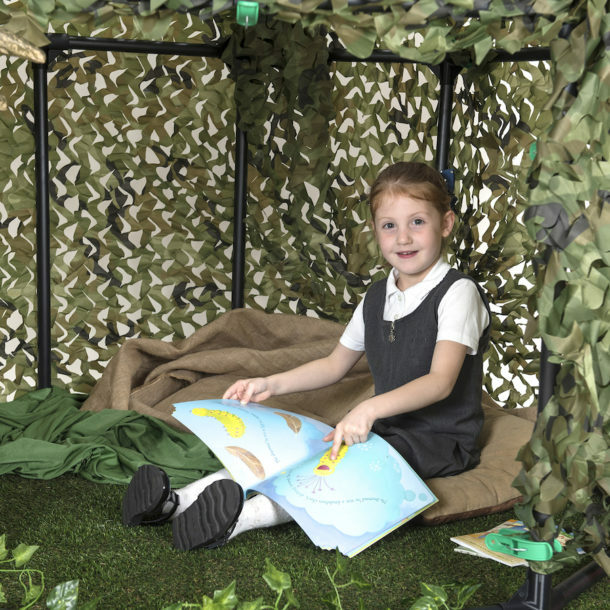 Engage reluctant readers by using these inspiring learning locations to make cosy reading areas. 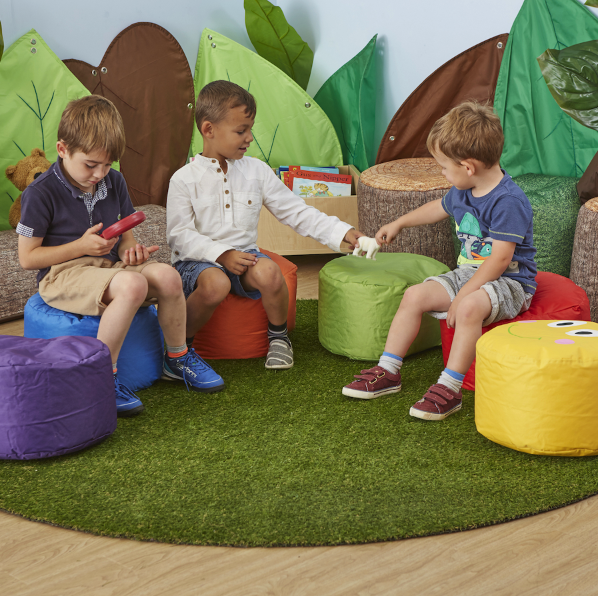 Impressive learning locations are great for kicking off a subject or theme and can be used as a learning zone for specific areas of the curriculum. Add ICT elements such as recordable talking points, talking pegs and clipboards to the areas to make them truly cross curricular. 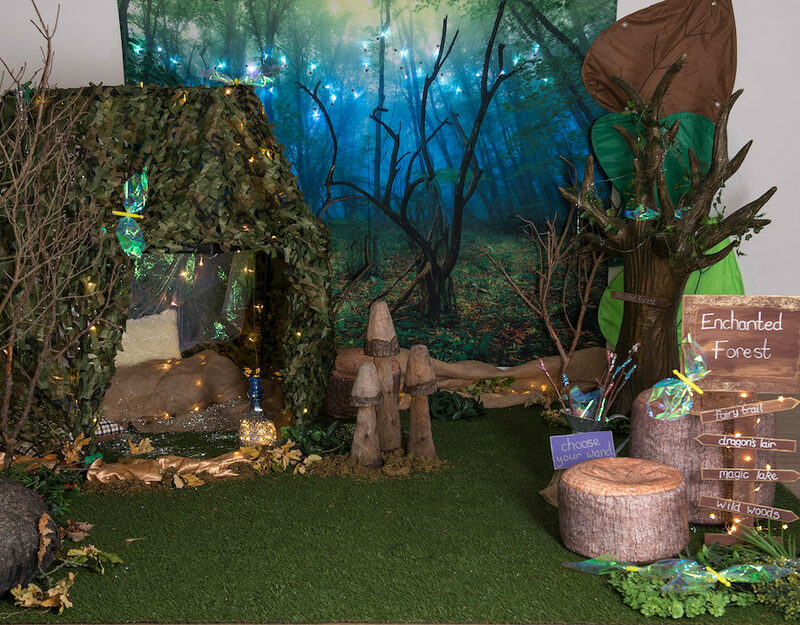 Follow these easy steps and transform your classroom into an exciting magical learning location with dancing fireflies, a cosy leafy cave lit up with twinkling lights and an old mysterious tree. Can you find any fairies? 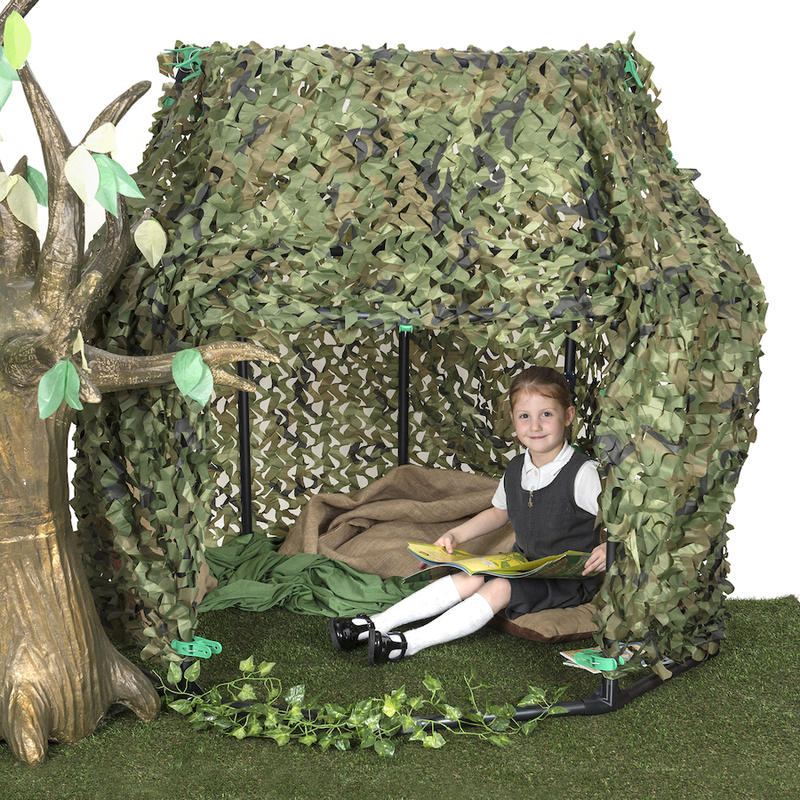 These creative immersive learning locations are ideal as multi-sensory learning locations – why not have a fairy themed reading area or use it to stimulate role play, storytelling and writing. Let the children’s imaginations soar when experiencing this inspirational area. 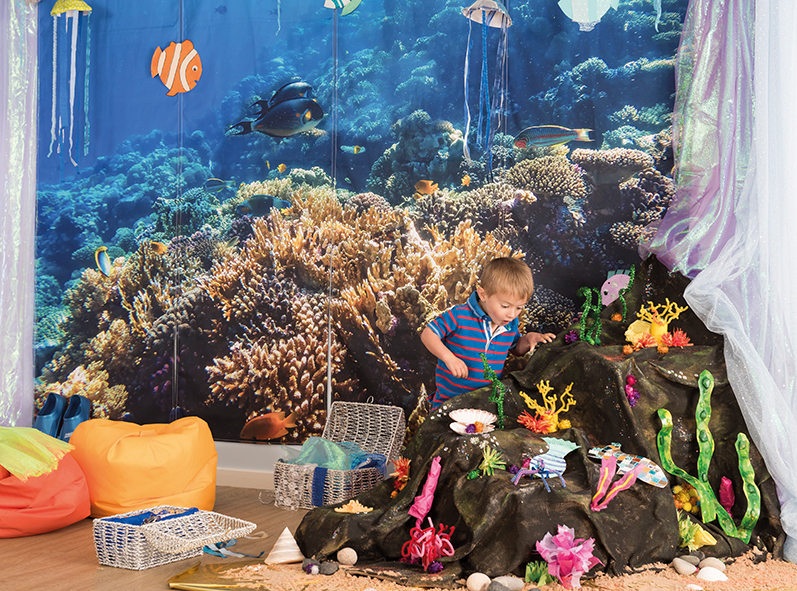 Create an underwater themed immersive learning location by using our Under the Sea Backdrop. 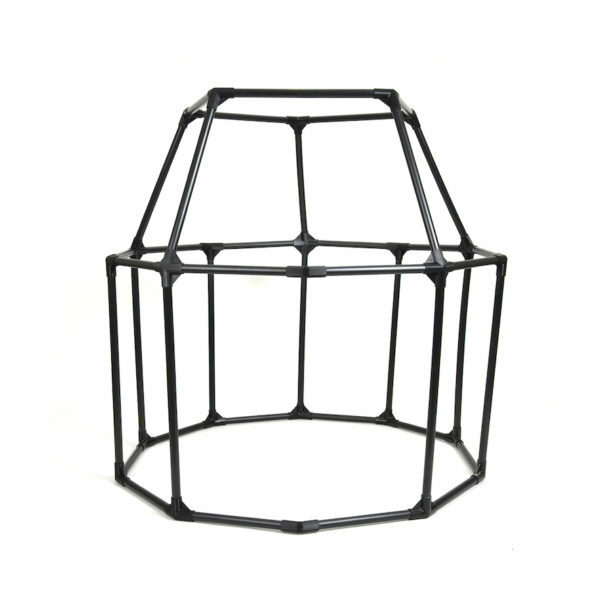 Dress this with Blue shimmery fabrics, netting, sand and shells. 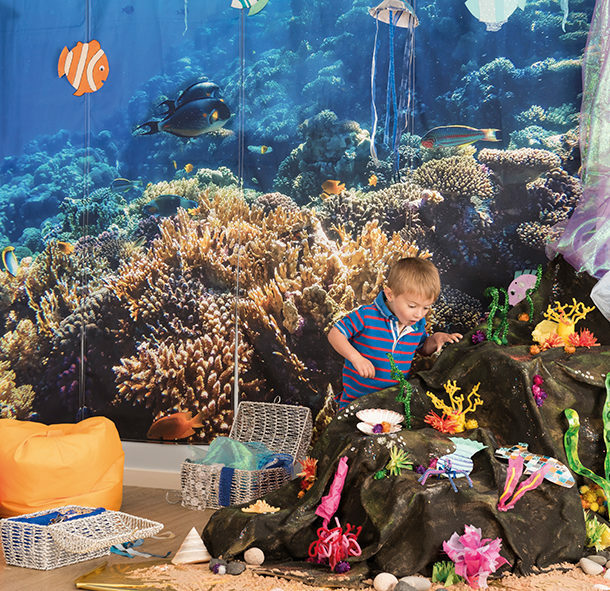 Why not make a reef and some fish and add a treasure chest with buried treasure? Add dress up items such as swimming goggles, flippers and arm bands. 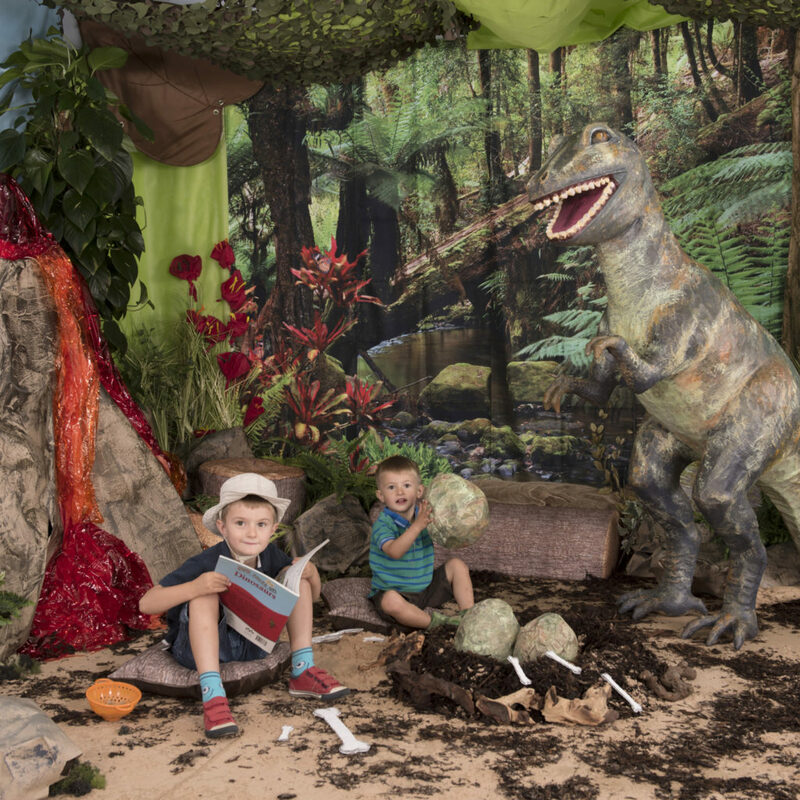 Follow these easy steps and transform your classroom into an exciting prehistoric land, enabling your children to step into the forest and walk with the dinosaurs! 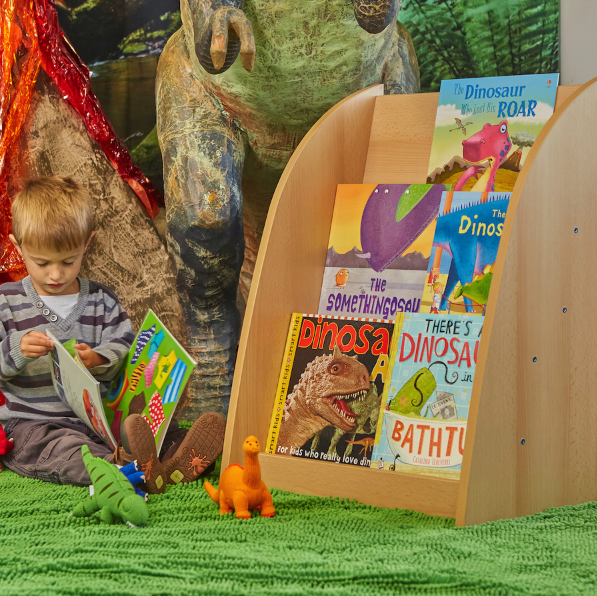 These spaces are ideal for learning locations – why not have a dinosaur themed reading area or use it to stimulate story telling and writing. 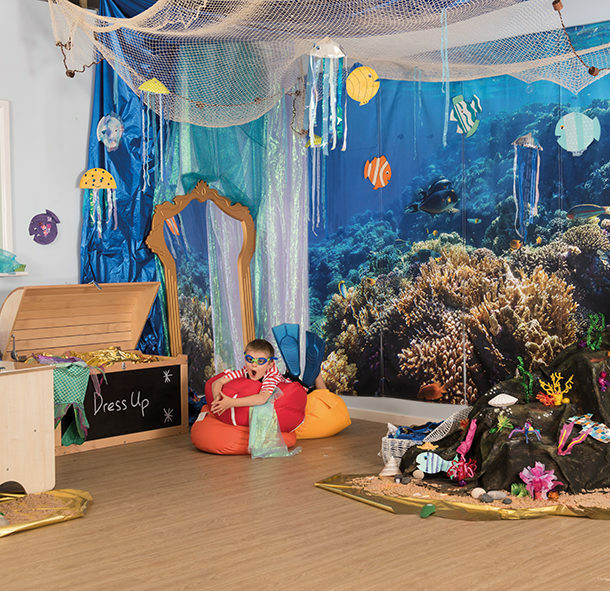 Let the children’s imaginations soar with this inspirational area. But watch out…. with their beady eyes, monstrous jaws and crushing teeth they might have you in their sights if they are feeling a little ‘peckish’! The Rainforest backdrop is an ideal starting point for this scene. 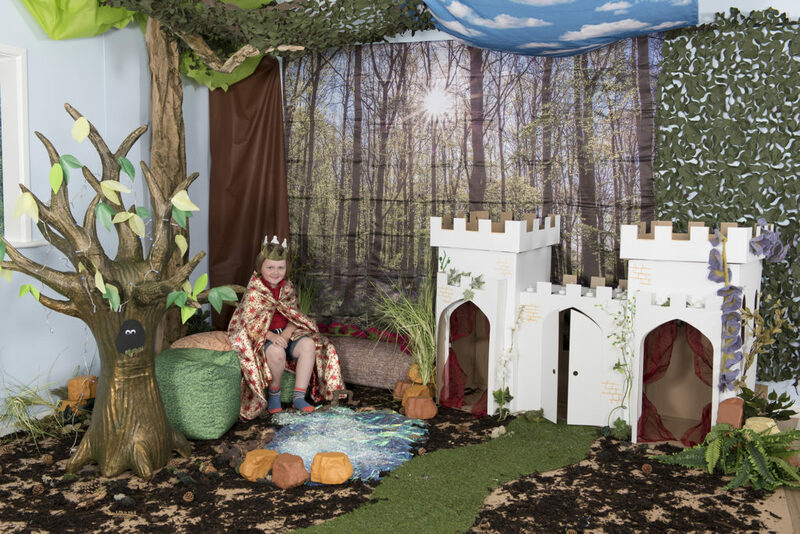 Whether searching for the ‘Gruffalo’, Going on a Bear Hunt, recreating a fairy tale or going ‘camping’, use our fantastic photographic backdrops, basic art room materials and a little imagination to transform an area of your school into a versatile ‘enchanted’ woodland learning area that everyone will love! Follow the instructions here. 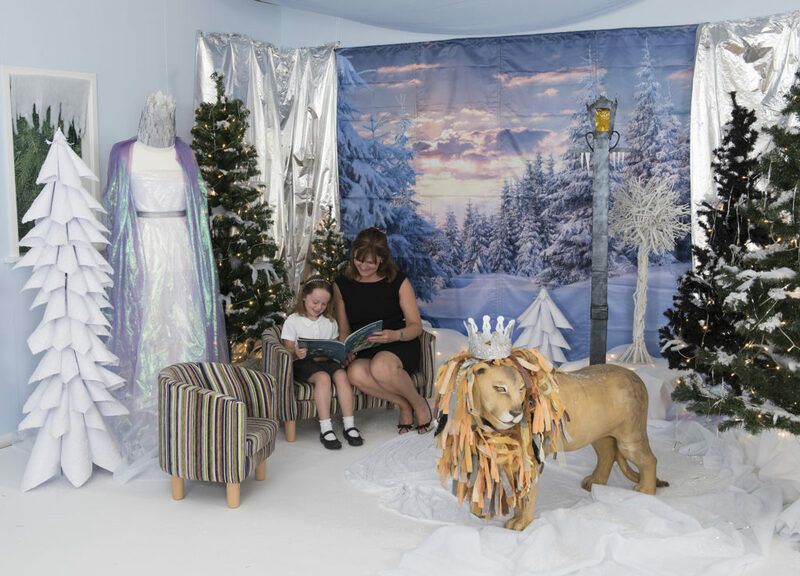 With winter just around the corner be inspired and take the opportunity to transform your classroom into an enticing, ‘icy’ learning and role play environment! 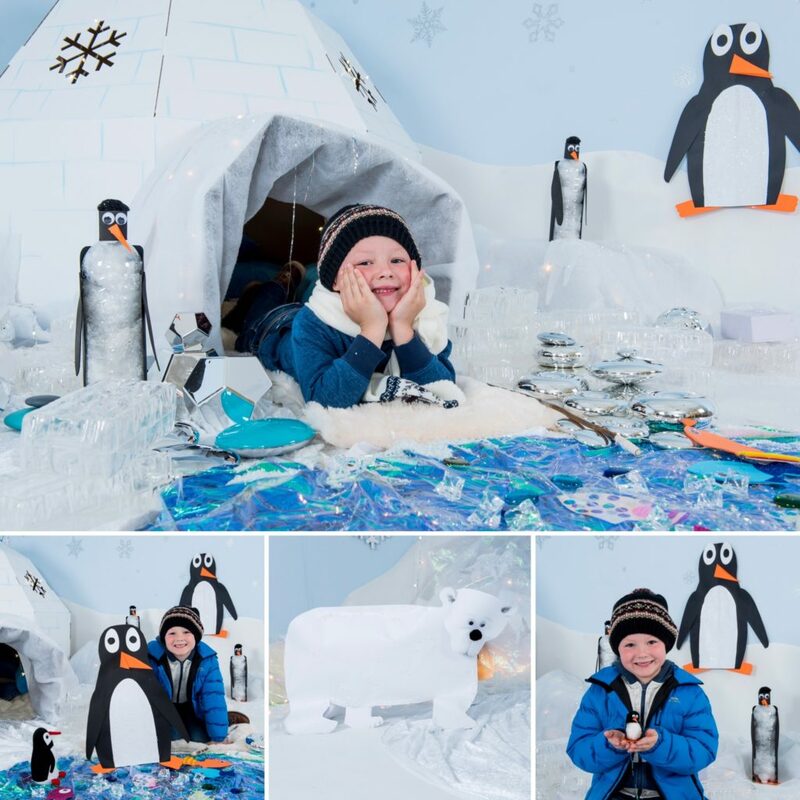 Who wouldn’t want to crawl inside the cosy igloo for a read, a mark-making session or to go fishing with the penguins? The Frozen backdrop really finishes off this scene. 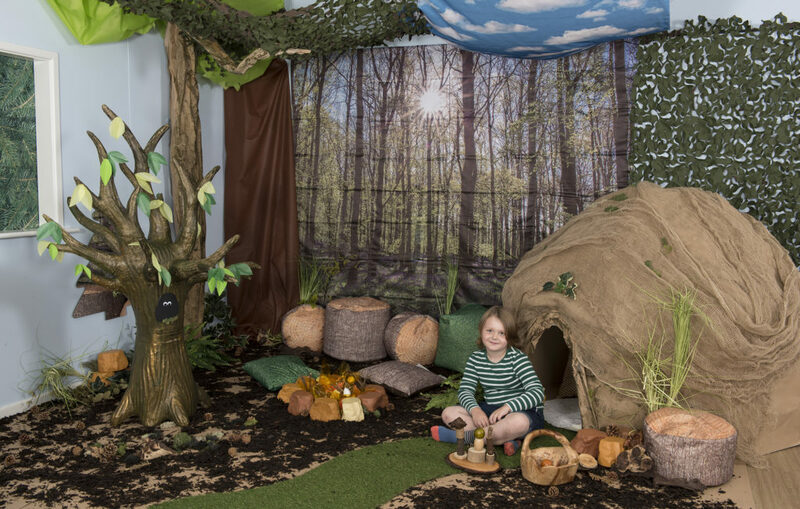 This step-by-step guide will help you to create a fantastic winter-themed immersive learning environment that will inspire and engage children. The frozen-themed backdrop is a super quick way of creating an area that is beautiful, long-lasting and open-ended. 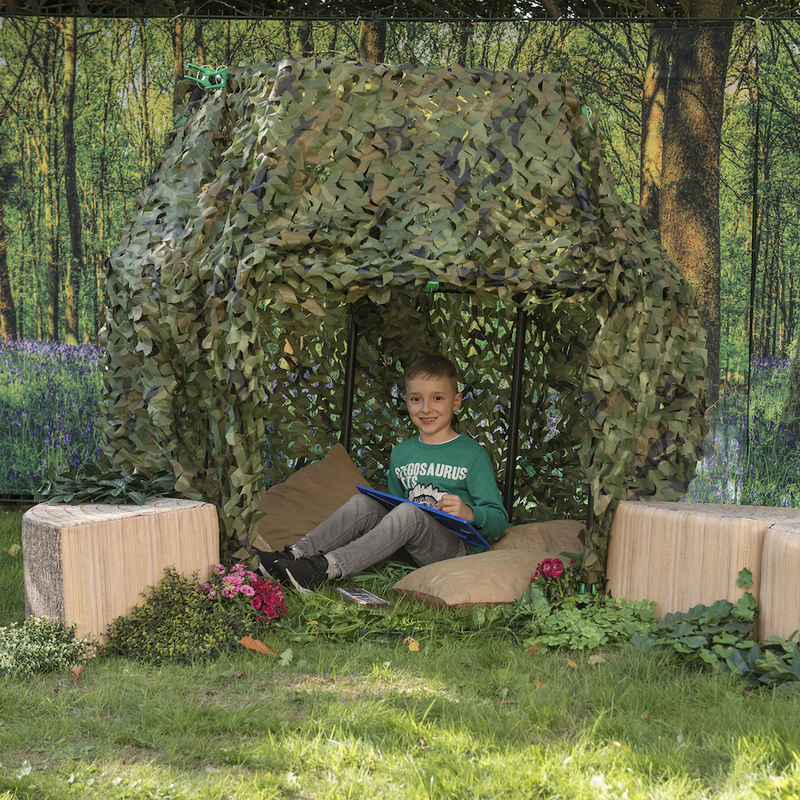 Follow these quick, easy steps and simple resources to create your sun dappled woodland scene…who wouldn’t want to crawl inside our cave for a quiet read! 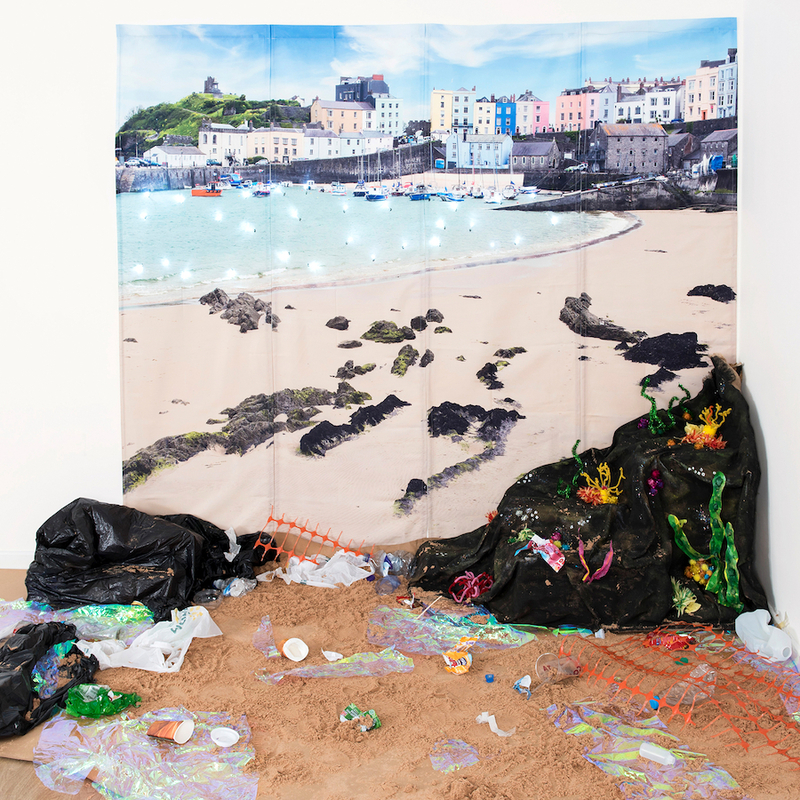 Topics relating to the sea and seaside are always very popular. They can be truly cross-curricular and are a great way for children to learn about (amongst other things) different types of environment, about creatures who live there and historical changes. There is so much fun to be had visiting and investigating the seaside and there are many wonderful resources to inspire children. Follow these simple instructions to create this scene. 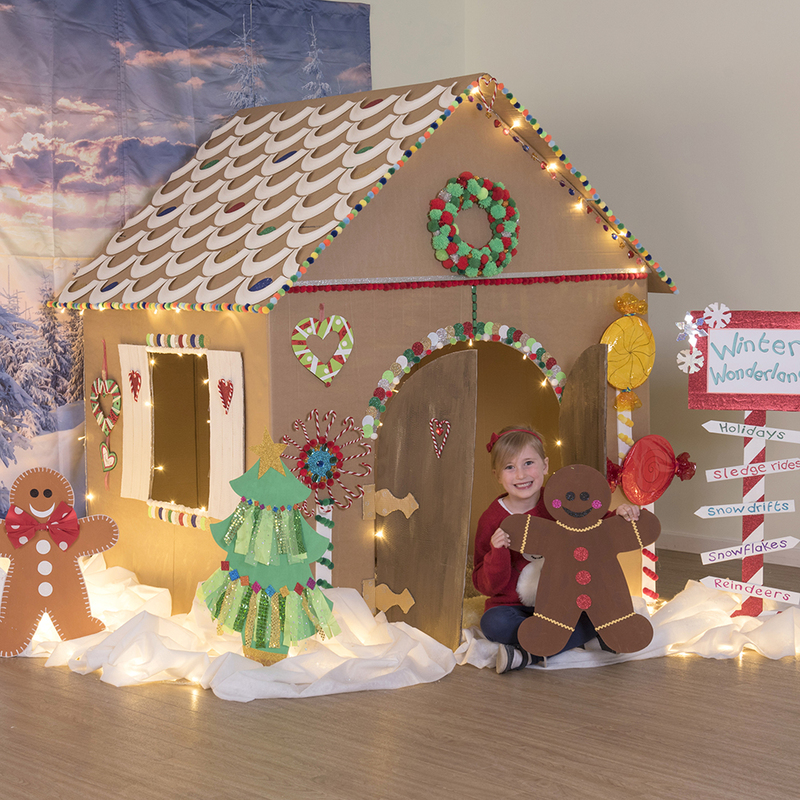 This festive Gingerbread House is simple to make and would make a great class project or after school club craft. Follow these simple instructions here. 5…4…3…2…1…Blast Off!!! 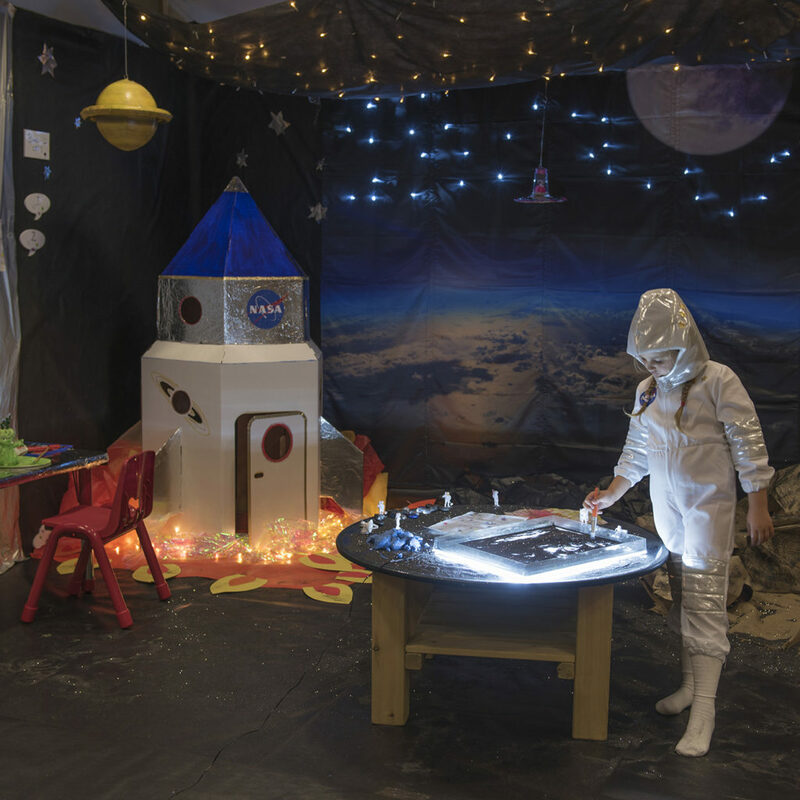 Enable children to follow in Tim Peake’s exciting footsteps and take one ‘giant step’ into your immersive themed space classroom. Why not create your own Space Station and set your little astronauts exciting intergalactic missions? Plenty of writing opportunities there! Follow these quick, easy steps and simple resources to create your own twinkling galaxy with dusty lunar surface to explore. Follow these simple instructions to create this immersive display. The rocket and Space backdrop are ideal focal points and really bring the scene to life. 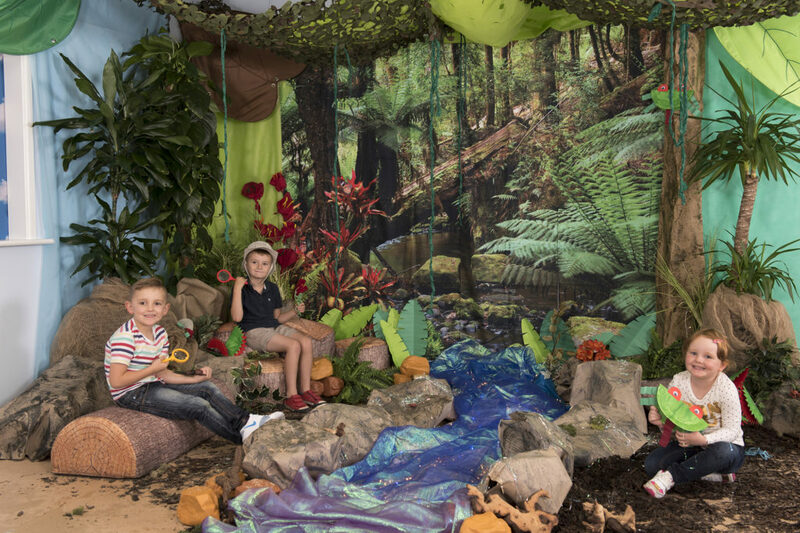 The Dinosaur display above can be easily converted into a beautiful Rainforest! Add a stream using blue voile fabric to suggest water, with fairy lights underneath. Line the stream with brown paper boulders and hang green ropes and vines made from tissue paper from the canopy. 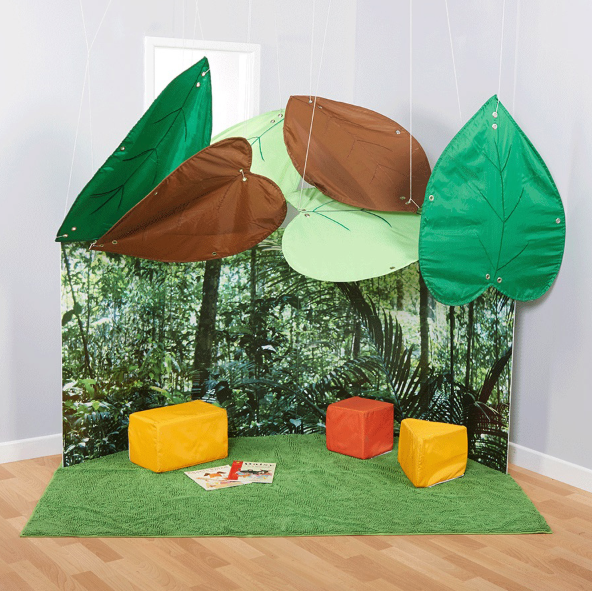 This simple learning location is brought to life with 4 items. 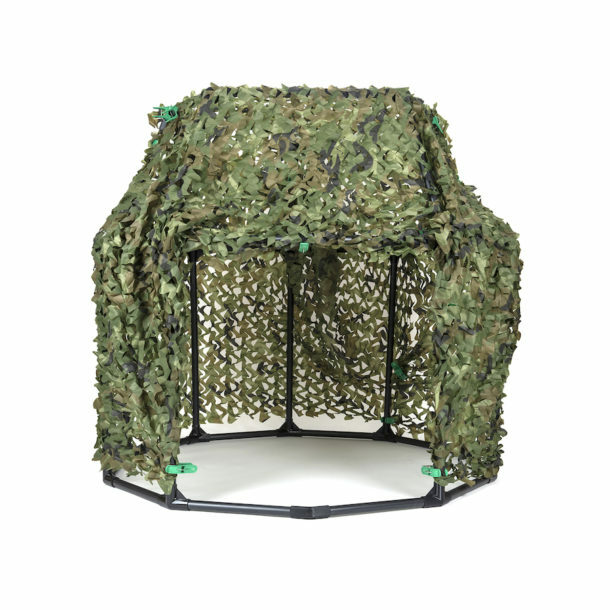 The Canopy leaves, backdrop, green rug or artifical grass mats and cushions. Create a cosy Christmas fireplace & hearth. 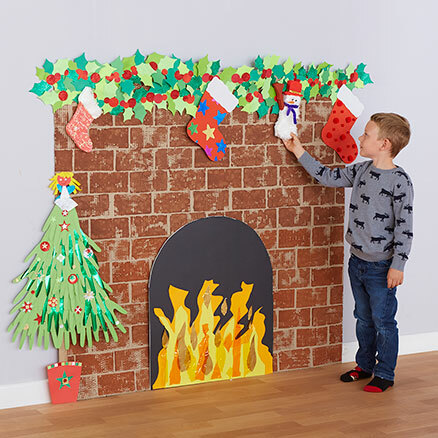 This Christmas Fireplace and hearth ‘how to’ blog looks at another creative display idea that will allow any aged child to use their Art, craft and design skills and create a little festive magic in school. A compact book case is ideal to fit into a themed area and hold a bespoke collection of books. Vibrant cushions including these rainbow coloured ones and the Woodland Tree Stumps Bean Bags make beautiful additions. 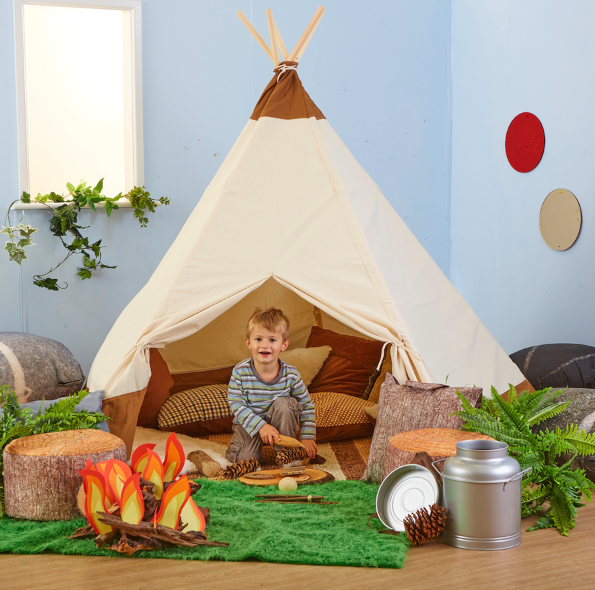 A Fabric Teepee also makes a lovely hideout or reading den. 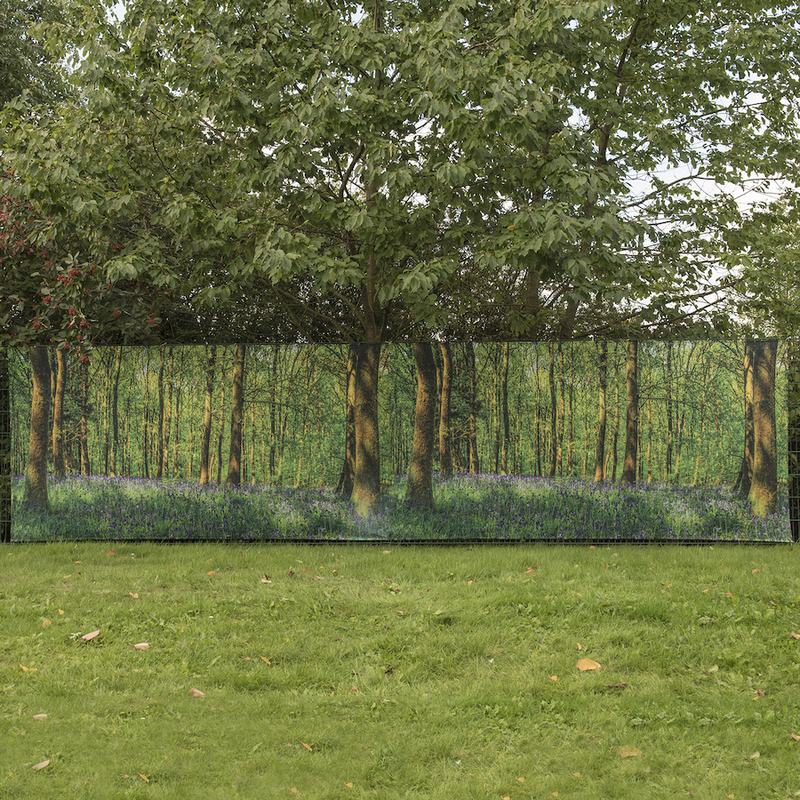 Outdoor backdrops are available for every season to create engaging learning spaces. 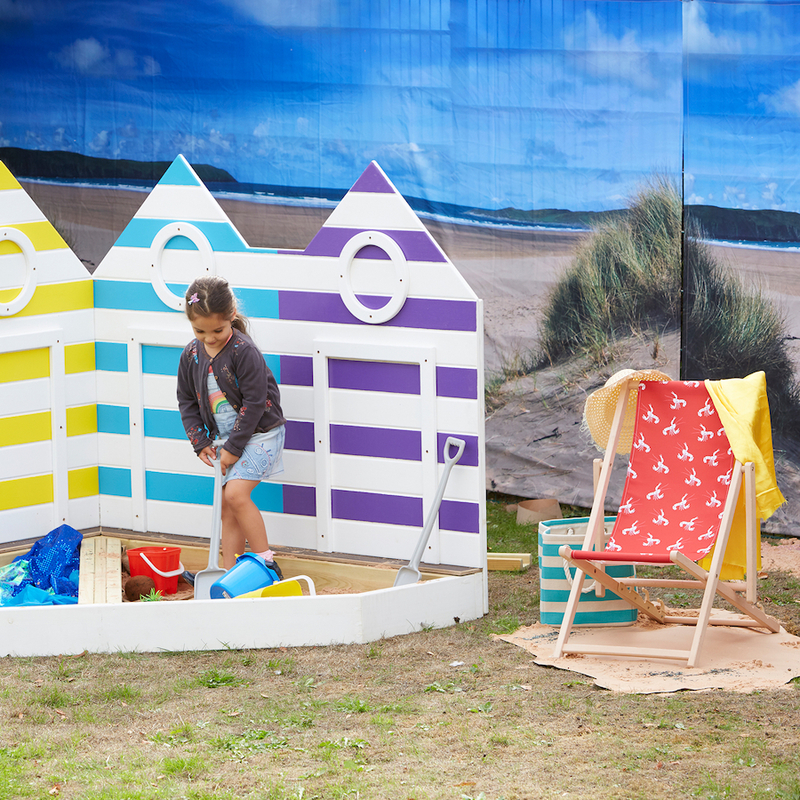 Transform uninspiring play spaces into exciting learning places using our re-usable outdoor backdrops. Bring nature’s ‘feel good’ factor into your playground using these easy to hang images. Made from weatherproof material and printed with gorgeous photographic forest scenes through the seasons. 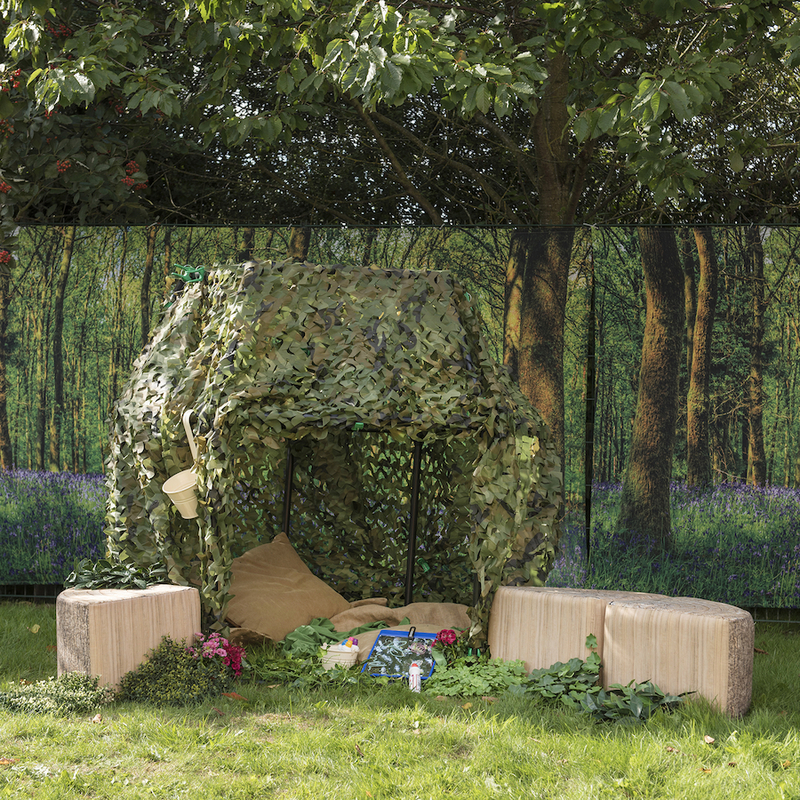 Combine with outdoor furniture/creative mark making/reading/role play resources etc and make your outdoor spaces interactive, sensory and exciting whatever the weather! 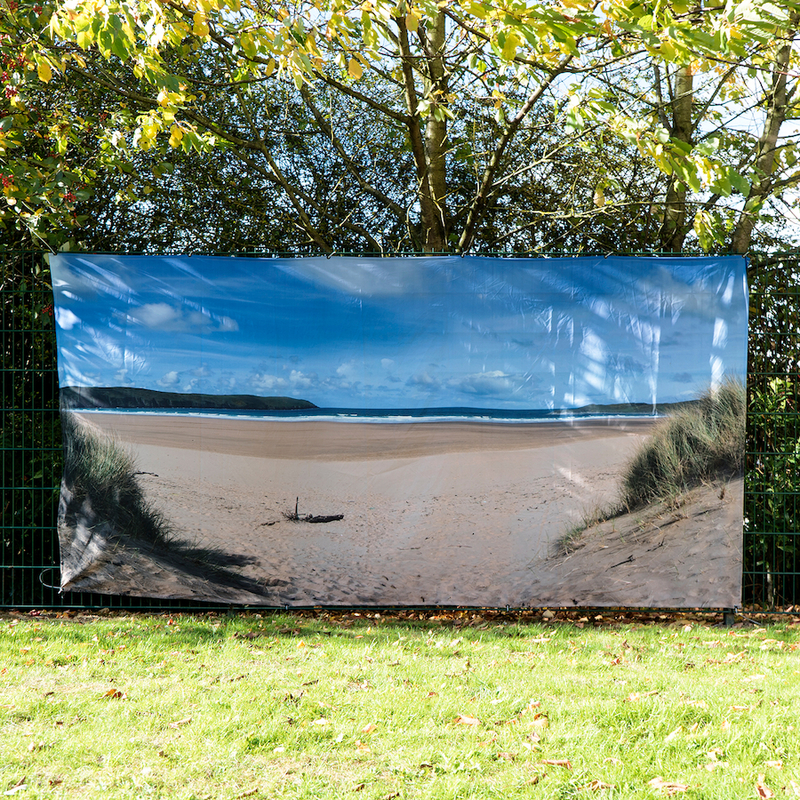 Create a simple learning location by using a back drop and a basic frame with fabric covering. Add cushions and fairy lights.